Before looking through the below presented fashion magazine from the 19th century, we recommend having a look at the glossary prepared by Ewa Orlińska-Mianowska of the National Museum in Warsaw. appliqué design: providing ornament to fabric or dress by sewing on fragments of fabric or haberdashery, beads, lace, sequins, forming ornamental motifs, frequently embellished with embroidery. 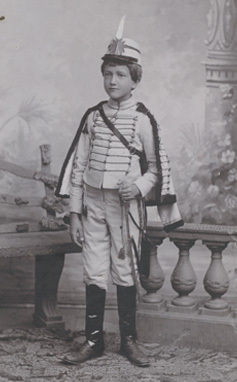 áttila: jacket of the Hussar uniform, braided in a characteristic way, also called a dolman; it was an undercoat forming part of Hungarian national costume. Worn over it was a short coat; lambskin-lined, it was called mente just like the outerwear over dolman in the Hungarian costume. bavette (Fr. bib): a triangle ornamental front of the bodice, women’s cape or a mantle, as well as a thin scarf covering the décolletage. 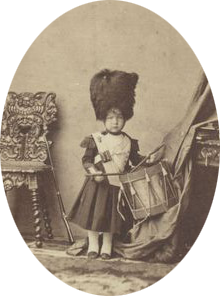 bearskin (bermyca from German): a high calpack of bearskin, a military headgear introduced as an element of uniform by Frederick William, father of Frederick the Great, initially assigned to grenadiers and guard regiments, later also worn by Napoleon’s guards and the Polish troops of the Duchy of Warsaw; today a characteristic garment of the British Royal Guards. uniform in the 1st half of the 19th c.
binda: 1. a kind of ornament worn around the neck made of a piece of ribbon, lace or velvet ribbon, with necklaces or other jewellery decoration threaded onto it; introduced in the Rococo, it was worn with ball gowns in the 1870s and 1880s. The most popular style then were bindas made from black velvet ribbon, with long ends hanging down the woman’s back; 2. in men’s fashion of the 2nd half of the 19th and early 20th c., binda was a kind of a band or cover used for modelling moustache or to prevent it from deformation during sleep. blouse: appeared for good in clothing in late 19th c. with the fashion tending to make the top part of the attire autonomous and overcoming the sentiment for a uniform dress. It was usually made from light fabrics: linen, batiste, silk, embellished with lace, ruche, ruffle, tucks, and worn under a jacket; in cut it resembled a men’s shirt with a collar, at one point even quite high, becoming a collarband, additionally stiffened with tortoiseshell stiffeners. maturity. The most sophisticated bonnets were worn in the Rococo – in their size and form, they outdistanced hats. Their lace, batiste ruffle, and ribbons were additionally embellished with flowers, haberdashery or papier-mâché decoration. The bonnet symbolizes the change of the woman’s marital status. The ritual of taking the wreath off the bride, cutting her plait, and putting on the bonnet, is part of the wedding ceremony. It is hard to trace fashion novelties in the wear of elder women. These are generally timeless clothes, full of dignity, echoing various past vogues. boullions: tassels made of different threads: silk, wool, gold, and ribbons; attire embellishment. braiding: adorning clothing with a number of haberdashery ornaments, typical of Polish and Hungarian clothing, often appearing in the 19th c., as a fashionable touch in women’s and men’s home-type attires. characterized by patterns composed of small holes or eyelets bound with overcast or buttonhole stitches, most commonly white; applied in the 19th and 20th c.
bustle: initially a horse-hair pillow, attached at the waistline, shaping the dress’s back train. It appeared in women’s clothing in the late 1860s, originally in the pillow-form, later as a special framework, and starting from 1878, in a several-layer half dress, made of folds and drapery, attached as a kind of a train. calpack: headgear with a round crown and high fur rim, sometimes split above the forehead and turned up. Since 1790 also the name used for the headgear of Polish infantry. the 1st half of the 20th c. it served a men’s fashion accessory. cerceau (Fr. circle): a wooden circle used in a popular game, consisting in throwing it and catching the circle on a stick. Chantilly lace (after the city of Chantilly in south-eastern France): bobbin lace, made from black silk thread; with mesh background and outlined floral pattern on the linen. The patterns of Chantilly lace were made up of flower bouquets and baskets; popular in the 18th c., particularly highly appreciated by Marie Antoinette. cravat: a kind of a small men’s scarf made of satin, taffeta, or serge, tied around the neck. Its origins similar to that of a tie: it is derived from a military uniform. crinoline: stiffened petticoat manufactured starting from the 1840s; initially linen, with a stiffening weft of horse-hair, hence its name (It. crino – horse hair, lino – linen), later made of flexible metal strips of openwork structure. This solution echoed the 18th-c. panniers. Crinolines reached their largest dimensions in the dome-shape in 1858. In ca. 1860, the greatest fashionable dressers wore even broader skirts reaching the diameter of up to 6-8 m. In the course of time, they became flatter on the front, while their back was slightly lengthened, in ball dresses it would eventually turn into a train. Charles Frederick Worth, the first designer of the grand Paris fashion, regarded to be the father of haute couture, who launched the couture house in Paris in 1859, was the one to introduce dresses with standing out decorative appliqué designs, enlivening the skirt domes. In the mid-19th c., just like in the previous century, Paris and the court of the famously elegant and beautiful Empress Eugénie who tried to match Marie Antoinette in this respect, was the capital of fashion. Worth designed his most beautiful outfits for the Empress and other royalties and aristocrats. delia: men’s fur-lined coat worn in the 16th and first half of the 17th c. It was first put over the sleeves, later commonly flung only over the shoulders; depending on the fashion, they were of different length; similarly the collar’s length varied, too. They were first buttoned with large buttons, later with loops. In the summer, they were worn without the fur lining. egret: a plume decoration attached to the hat or hair, sometimes also set like jewellery. Popular in the 19th c. and until the 1930s. The name derived from birds of a heron family whose plumes were basic material for this kind of embellishment. engageantes: lace ornament of men’s and women’s sleeves characteristic of the 18th c. The set of these included lace to be worn around dress sleeve ends, around boots, and the collar. excursion jacket: short jacket of felted wool. In the last quarter of the 19th c. both men and women became more physically active. One of the recreations was hiking, also in the mountains, combined with climbing. This is how mountaineering was born. Apart from loosely-fitted and comfortable clothes, it also required special equipment: boots, a hat, stick, and basic climber’s gear. The clothes of the first mountaineers in the Tatras copied the local costume: light trousers and a short jacket. They were made of light woollen fabrics, slightly felted, therefore waterproof, such as striped melton popular at the time. been fashionable. At the turn of the 19th and 20th c. some new ways were adopted which allowed for selecting the clothing appropriate for the occasion. Apart from the cut, the clothes would differ in some detail allowing to identify their function. The meaningful details were: fabric’s type and colour, finishing off: in lapels, and pockets, kind of stitch, number of buttons. Actually the latter was not specified for frock coat: it varied from 8 to 4 on the front, two were placed above the centre vent at the back, and 4 on each sleeve. An important element could also be seen in the highly-buttoned waistcoat with turned-down lapels, a small bow-tie under a small, high stiff shirt collar, usually worn with formalwear. haberdashery: tapes, braids, lace, ornamental twisted cords, used for trimming clothes, furniture, cushions, saddles, and harnesses. jabot: embellishment made of lace, embroidered linen, tulle or georgette, worn below the shirt neckline from the end of the 17th and throughout the 18th c. as an attachable decorative accessory, forming part of a set of the engageantes. In the 19th and 20th c., jabot also appeared in women’s fashion as adornment of the bodice, blouse, or little jacket. justaucorps (Fr. tightly fitting): men’s coat worn in the late 17th c. and early 18th c., with suppressed waistline; with stiff folds down from the hip-line which by sticking to the sides, broadened the figure; three quarter sleeves featured characteristic wide cuffs. The sleeves ended in lace engageantes. kilt: men’s skirt, flat at the front, pleated at the back and sides, element of Scottish national costume. ended in cuffs of a characteristic shape, were turned out and flung over the back. Its length varied depending on the fashion and circumstances in which it was worn. By wearing the kontusz one also manifested a certain attitude, namely patriotism and commitment to the national cause; therefore, just like the czamara, it either served as the dress of insurgents, or inspired the insurgents’ fashion. lambskin: edging of black or white lambskin, sometimes specifically sheared and dyed, decorating women’s winter outfits: along the edges of a woman’s robe, collar, sleeves, and a calpack. lorgnon: eyeglasses held to the eyes on a long handle resembling scissors, very fashionable by the end of the 19th c.
magierka (Hungarian cap): men’s hat of Hungarian origin, resembling a felt calpack. monocle: formerly small binoculars, held to one eye, later a lens put directly into the eye socket, allowing to take a closer look at chosen items. Starting from the 2nd quarter of the 19th c. it was mainly used by men. Quite frequently when putting it to the eye in the presence of ladies, they demonstrated the interest they were taking in them. morning coat: men’s coat, of open front, splitting from the top button. At the back split into tails topped with buttons (similarly as in tailcoat). Together with a waistcoat, striped trousers, and a cylinder, it was regarded as informal form of half dress. By the end of the 19th c., worn with a skirt over a blouse, it became part of women’s clothing as a jacket; a skirt and jacket of the same colour made a suit. mourning jewellery: expressed the patriotic feelings, often commemorated insurgencies. Special rings were, e.g. worn to commemorate the battle of Olszynka Grochowska. Certain battles were commemorated with miniature religious medallions. Crosses of Olszynka were traditionally made from twigs of alder trees growing on the battlefield. The idea of the crosses is traditionally attributed to Klaudyna Potocka and Adam Mickiewicz. During the November Insurrection, the fashion was for wearing national ribbons with an Eagle. Mourning jewellery was worn in the 19th c. throughout Europe. It reflected the grief felt at someone’s death and complemented the mourning wear. E.g. Queen Victoria wore it after Prince Albert had passed away. There was also a vogue for sentimental jewellery, most commonly made from beloved’s hair: a kind of memento handed when splitting up. muff (handwarmer): winter fashion accessory for ladies, protecting the hands. Usually made of a cylinder of fur, velvet or another fabric, lined for warmth, sometimes with additional little pockets for certain essentials; apart from a handkerchief, they could hide a vial of perfume or a purse. Though the latter appeared relatively late, as ladies did not carry any money, merely some coins to put for collection in church or to give to a street beggar. If they did any shopping, this was paid for by the husband, and only after several shopping sessions of the wife who would mainly shop for dresses, fabrics, and various accessories. although coloured, were trimmed in black. 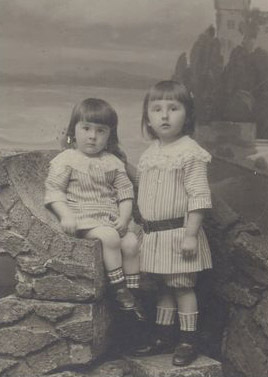 Even young girls wore black, grey, white-and-black dresses or with grey stripes. 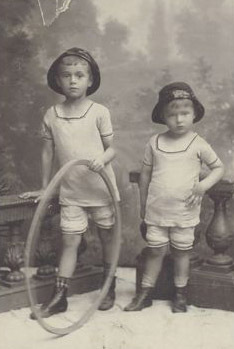 To the extent that toys for children gained some mourning elements, too: wooden rings that boys rolled were covered with black-and-white ribbons. Also jewellery expressed the same emotions: iron bracelets resembling national fetters, brooches in the form of thorn crows, replaced family jewels which had been donated towards the uprising. Insurgence jewellery was most commonly made of onyx and black Venetian glass, as well as ebonite, wood varnished black, or black-glazed metal. Among the biggest number of pieces preserved from the period we find black enamelled rings with a silver eagle, and wooden crosses with metal pieces worn on chains and velvet ribbons. The patriotic zeal was not curbed even in the aftermath of persecution for displaying such jewellery. It was worn for five years. pannier (or side hoops, Fr. basket): a rigid dress or frame covered with linen, worn as underskirt to make the dress stiff or to give it an appropriate shape. pardessus: a long cloth overcoat with a collar trimmed with velvet, usually worn in full dress and for formal occasions. pince-nez: glasses without temple arms, put in place on the nose with the use of a spring or held by a small handle. Ladies carried them hanging on a rope attached to the belt, gentlemen carried them in their waistcoat pocket; their name means ‘nose pinching’ due to a peculiarly constructed nose grip. A fashionable accessory of women’s attire in the 19th c. and early 20th c., similarly as lorgnon. pleat: stiffly ironed fold, an ornamental element, resulting from the garment’s cut. ringlets (English style): type of hairstyle which appeared in the Biedermeier; the hair split with a parting over the forehead, flat on the top and tied in a bun, with single streaks twisted like springs and tied on the sides, above the ears. ruche: a strip of fabric (ruffled, pleated, or folded) used for trimming the bodice or skirt. This kind of ornament was popular in the 18th c., while in the 19th c. it recalled the past fashion, adding a historical touch to the new cuts and forms of clothing. with a small neckline was then supplanted by the suits exposing the back, arms, as well as the legs. tassels: haberdashery decoration in a form of fringe bunch. top hat: a tall, stiff hat, cylindrical in shape, with a narrow brim; commonly made of satin; less frequently of velvet and felt; most often black, yet in the 2nd half of the 19th c. also coloured top hats were worn. They were extremely popular at the turn of the 19th c., presently worn very rarely: either with eveningwear or in the equestrian sport called dressage. A collapsible opera hat, with a spring inside, is a top hat variant. veil: thin, scarcely meshed, transparent fabric, most often tulle or chiffon, attached to the hat, covering the face, particularly fashionable during the Art Nouveau period; currently an element of a woman’s mourning headgear. 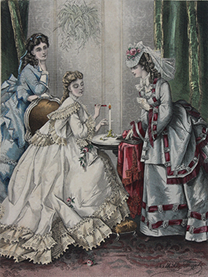 vetement, polonaise: type of a part of women’s garment: a combination of bodice and tunic, could be cut separately, or as a bodice sewn together with the tunic. volant: a broad ruffle, cut from flared fabric, trimming sleeves of a dress or cape, and neckline, also sewn onto skirts. wedding dress: white wedding dresses became the bride’s clothing only in the 19th c. Earlier, the distinct element of the wedding outfit was to be found in the headdress. In compliance with the old tradition, this was a myrtle wreath symbolizing purity; later, a similar meaning was to be found in the orange blossom decorating the bride’s head and dress. Made of silk and wax, almost identical with the real ones, they constituted an essential ornament on the wealthy brides in the 19th c. Starting from the mid-19th c. an important element of a woman’s wedding dress was to be found in the veil of tulle, chiffon, or lace, which in its most impressive form turned into the train. An important accessory was the flower bouquet, previously accompanying the ball outfit. It underwent a transformation from being a small modest touch: oval, surrounded by lace Biedermeier style, to large floral compositions cascading down, popular in the interwar fashion. żupan [zhupan]: old-Polish men’s coat cut as a long robe, buttoned with a line of small buttons, hook-and-eyes, or braiding, worn by the nobility from the 16th to the mid-19th c.